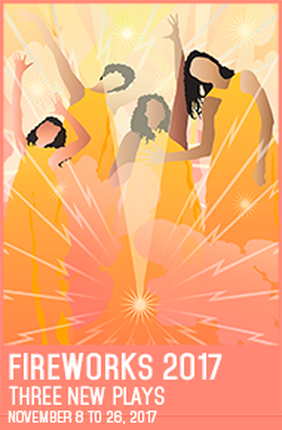 FireWorks is Alumnae's annual festival of new full-length plays, developed either by our own New Play Development group or at our New Ideas Festival. Three plays are programmed each running for one week, all fully produced, offering audiences thought-provoking theatre and a chance to pull back the curtain with post-show panel discussions and playwright/director talkbacks. We will also be hosting our annual Writers' Intensive with three writing workshops lead by Donna-Michelle St. Bernard, to be held on three successive Saturdays: Nov. 11 / 18 / 25 from 9:00 - 12:00. Click here to learn more. Toronto director, dramaturge, writer and sometime actor, Molly Thom is best known as the author/director/producer of The Bush-Ladies (NAC, Tarragon Theatre, Ontario tour, Artword Theatre). She has directed many plays for Alumnae, most recently Shirley Barrie’s I Am Marguerite in 2015, and last appeared on stage as Hecuba in The Trojan Women in 2012. She is the co-founder of Alumnae’s New Ideas Festival and the resident director of Shoestring Opera. Alexis previously worked with Alumnae on August: Osage County. She has also designed Sabrina Fair, Scotland Road, Moonlight and Magnolias, and The Tale of the Allergist's Wife with Amicus Productions, and Queen Milli of Galt and Real Estate at the Village Playhouse. Liam Stewart is a young Canadian filmmaker and lighting designer. Most of his work consists of bare bones no budget short films which you can find under his company name Single Tear Pictures. Liam is also an avid writer and photographer who enjoys leisure strolls through the wilderness. Donna Langevin wears a triple hat. Poet and playwright, co-author of four ESL books, her latest poetry collections include In the Café du Monde, Hidden Brook Press 2008, and The Laundress of Time, Aeolus Press 2015. She won first prize in a TOPS Contest 2008 and also in the Cyclamens and Swords contest 2009. She was short-listed for the Descant 2010 Winston Collins prize in 2012 and won second prize in the GritLIT Poetry Competition in Hamilton, 2014 for a suite of poems. In 2017, her poem was awarded second prize in the Banister Anthology Competition. In 2014 and 2015, her plays, The Dinner and Bargains in the New World won first prizes for script at the Eden Mills Festival in Guelph, Ontario. Jane Carnwath has had a long career in theatre as a director, teacher, adjudicator and writer. Her most recent of many directing assignments for the Alumnae Theatre are Yeats in Love for the 2016 New Ideas Festival, and The Lady’s Not for Burning. She has also directed for Sheridan College’s Music Theatre Program where she taught acting for several years, and for the York University Theatre Department. Jane has adjudicated community theatre festivals all over Canada and conducts workshops in acting and directing. She produced Inked Heart for FireWorks2016. Suzanne loves creating art for theatre. She also loves to act (shows include Pride and Prejudice, A Lie of the Mind and The Pear is Ripe for Alumnae) and write (plays in New Ideas, Inspirato and Nuit Blanche). And she loves Molly. Rhona is a member of Alumnae's New Play Development group and an aspiring playwright. She produced The Creases in My Sari for last season’s FireWorks Festival.